We are going to work with a pivot table example in this section. We shall learn some useful ways to work with pivot tables. The following figure shows part of a data table with 3,144 data rows. 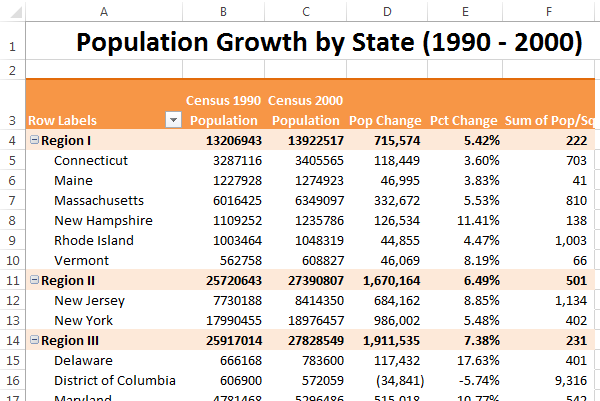 Each row displays information about a state and its population. This data table contains data of each county in the United States. County: The name of the county of United States. State Name: The state of the county of United States. The following figure shows a pivot table created from the county data table. 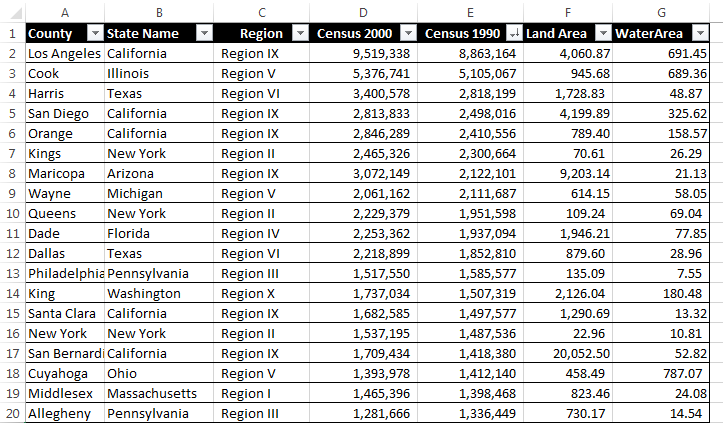 To create this pivot table, We have placed the Region and State Name fields in the Rows area and placed Census 2000 and Census 1990 in the Values section. This pivot table has been created from the county data. Read More: How to Insert a Calculated Item into Excel Pivot Table! Tip: You can view (or document) of calculated fields and calculated items in a pivot table. 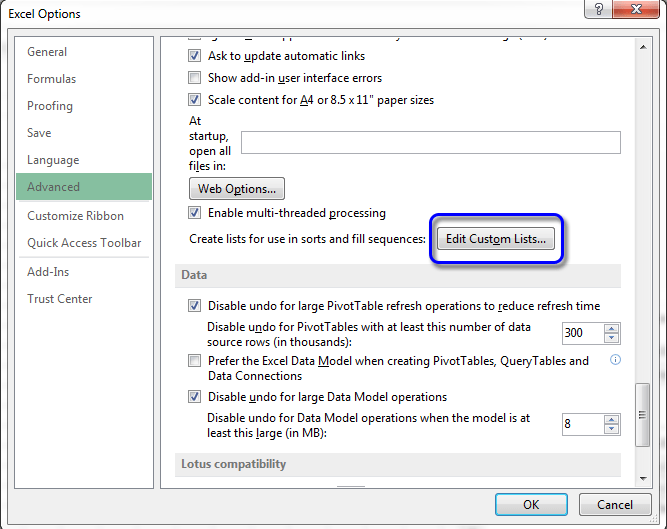 To do so choose PivotTable Tools ➪ Analyze ➪ Calculations ➪ Fields, Items & Sets ➪ List Formulas Excel. This will insert a new worksheet with information about your calculated fields and items. Following two figures show the command and output of selecting this command. 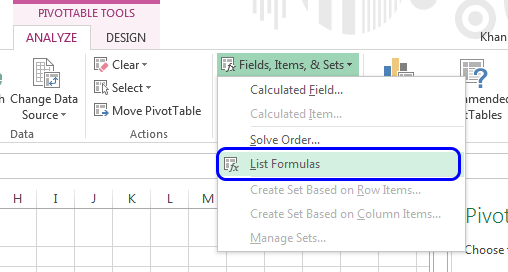 List Formulas command under PivotTable Tools ⇒ ANALYZE ⇒Field, Items, & Sets. This worksheet lists calculated fields and items for the pivot table. You can sort this pivot table based on two fields. The main sort is by Region, and states within each region are sorted alphabetically. To sort, just select a cell and right click and choose from the shortcut menu. If you want to sort the Region, click a cell that contains a Region and if you want to sort states, then select a cell that contains a state. We have selected a state name and right clicked. This shortcut menu has appeared. Choose how you want to sort the list. Sorting by Region sometimes may require some additional effort because Roman numerals are not always in alphabetical order. In my example, I did not have to do this additional effort to sort Region. But you may need. First of all, you have to create a custom list. 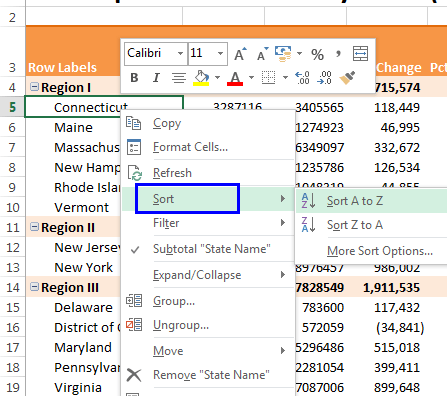 To create a custom sort list, access the Excel Options dialog box, select the Advanced tab, and then click Edit Custom Lists. 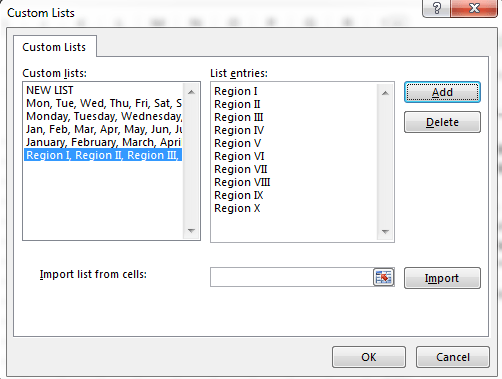 Custom List dialog box will open.Click New List, type your list entries and click Add. The following figure shows the custom list I created for the region names. This custom list ensures that the Region names are sorted correctly.